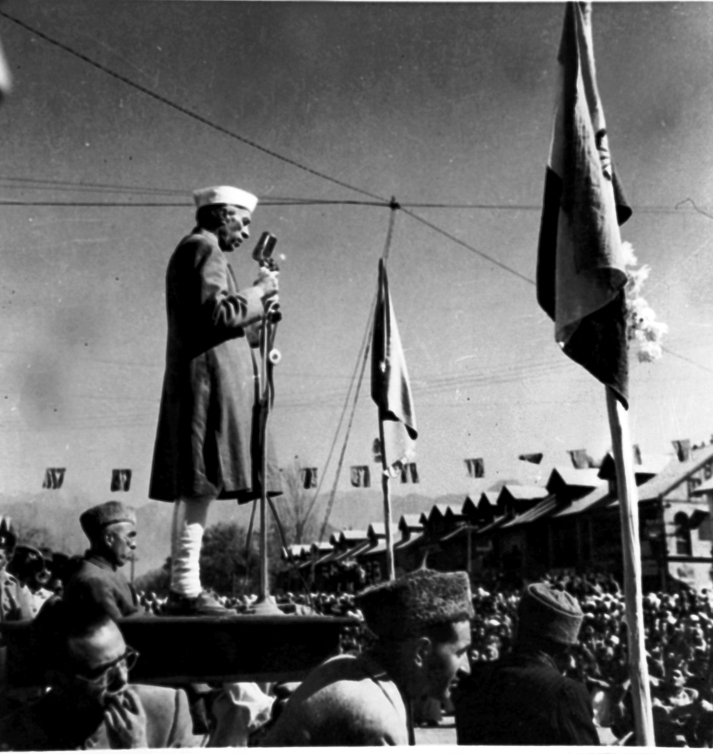 A November 1949 photograph showing Jawaharlal Nehru, Prime Minister of Indian making his first important speech in Lal Chawk. Duing the course of his speech he said “India will never let down Kashmir and the Indian Army will fight on till the last raider is driven out”. Both as the president of the All India States People’s Conference and as a Kashmiri, I have been greatly troubled by the recent developments in Kashmir. I have said little about them so far because I wanted more facts. My first impulse was to go to Kashmir, but I refrained from doing so till I had more information. I know that the kind of messages that we have been getting through press agencies are completely one-sided and unreliable. These press agencies only send out messages approved by the State authorities. I have now had a vivid account of the happenings in Kashmir from Bakshi Ghulam Mohammad and Mr Dwarka Nath Kachru who have recently arrived here. They will be issuing statements themselves, and so I need not repeat what they are going to say. Many questions have been put to me about the new orientation given to the popular agitation in Kashmir with the demand for Quit Kashmir based on the Amritsar Treaty. It has been, and is, the policy of the All India States People’s Conference to demand full responsible government in all the States under the aegis of the ruler who is to act as a constitutional head of the State. That has also been the policy of the Kashmir National Conference of which Sheikh Mohammad Abdullah is the president and leader. During the last few months, however, the State authorities have been pursuing a policy of direct hostility to the popular movement in Kashmir and trying to disrupt it by various undesirable methods, including encouragement of the communal issue. The position of the popular Minister there, Mirza Afzal Baig, became impossible and he had to resign. Subsequently, in defiance of their own rules, they appointed another person, who was till then also a member of the Kashmir National Conference, as Minister. This was the result of a secret intrigue about which no one knew. There was considerable resentment at these tactics of the State authorities and feeling against them grew. Evidently, they were bent upon creating trouble and many weeks ago they started bringing in the State army to the valley and distributing it at various strategic points. Some weeks ago a committee of the National Conference sent a memorandum to the Cabinet delegation raising the question of the Amritsar Treaty and demanding that this treaty be abrogated and Kashmir be ruled by the people of the State. This new policy reflected the growing tension in the State and the rising temper of the people against the State administration. There were many charges also of corruption and nepotism in the State administration. This new policy had not been endorsed by the National Conference or its executive. Normally it would have been considered by that executive on the 26th of this month. But, meanwhile, events marched ahead. Sheikh Mohammad Abdullah spoke publicly about this new policy. Personally, I think that it was unfortunate that a marked variation in the policy both of the All India States People’s Conference as well as of the Kashmir National Conference should have been made without the full consideration of the respective bodies. But I recognise the feeling which gave rise to this policy in Kashmir and the total ineptitude of the State authorities which gave rise to that feeling. I should like to make it clear that the policy of the All India States People’s Conference remains what it was — that of responsible government under the aegis of the rulers. Indeed no one can change it except the Conference itself. But events in Kashmir, as also happenings elsewhere in the States, are repeatedly bringing this issue before the people of the States and it is possible that unless quick changes towards responsible government take place in the States, the rulers may no longer be welcome even as constitutional heads. There is a great deal of talk of dynastic rights and privileges, but no dynasty or individual can claim to override the fundamental rights of the people. If the rulers remain, they can only do so by the goodwill and desire of their own people, and not by compulsion of external or any other authority. Sovereignty will have to reside in the people and what follows will thus necessarily be according to the wishes of the people. I am not interested in the legal implications of the Amritsar Treaty or any other treaty. I am interested primarily in the good of the people and their right to decide for themselves what their government should be. While, therefore, I think it regrettable that the issue of the ruler continuing or not was raised in Kashmir at this stage without reference to the organisation concerned, I must make it clear that it is open to any individual or group to raise that issue, if it chooses to do so on its own responsibility. If this is done in a peaceful way, no State has a right to suppress it. What happened in Kashmir clearly demonstrates the desire of the State authorities to avail themselves of any pretext to crush the popular movement. I have requested Sheikh Mohammad Abdullah to come to Delhi for consultation. At a public meeting in Srinagar, he announced this fact and said that he was going to Delhi within a few days. He further directed that no public meeting or agitation should take place during his absence from Kashmir. It was clear that he wished to discuss the whole situation with me before taking any other step. Three days later he was on his way from Srinagar to Rawalpindi when he was arrested and about the same time a large number of his colleagues, both Muslim and Hindu, were arrested at various places in Kashmir. The whole of the valley was handed over to military administration. The police, being Kashmiris, were withdrawn. A reign of terrorism and frightfulness then began. Kashmir has practically been cut off from the outside world since then and martial law prevails there. There have been conflicts with crowds and firing on numerous occasions. My information is that far more people than officially admitted have been killed. A much larger number who were wounded were sent to jails instead of hospitals. Srinagar is almost a city of the dead where movement is difficult and large numbers of people are practically interned in their own houses, apart from the many hundreds who have been put in prison. Clashes occur daily and even women have been shot down. But what is far worse is the deliberate attempt, reminiscent of martial law days in Punjab in 1919, to humiliate human beings. I understand that people are made to crawl in some of the streets, that sometimes they are made to take off their turbans to clean the streets and pavements, that they are made to shout at the point of the bayonet Maharaj Ki Jai. Dead bodies are not handed to the relatives for burial according to religious rites but are soaked in petrol and burnt (Nehru retracted this part of the statement later). 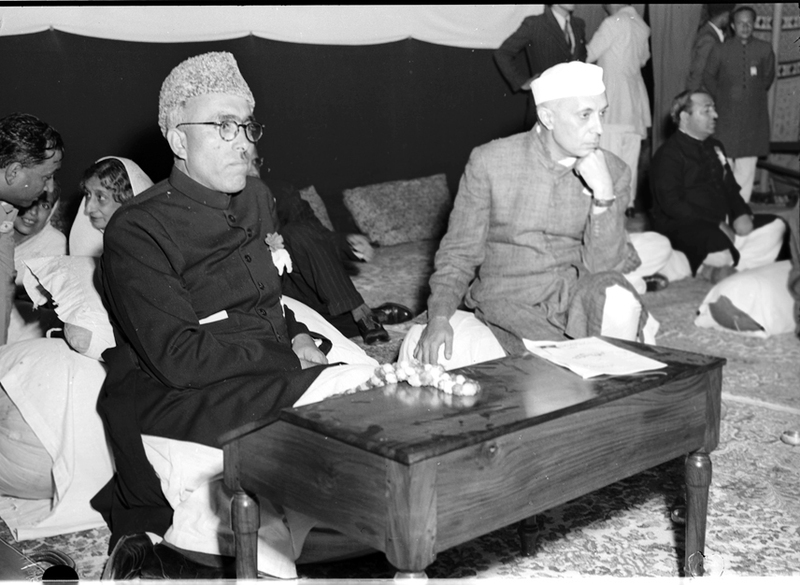 A September 24, 1949 photograph showing Pandit Jawaharlal Nehru and Sheikh Abdulah during the meeting of the Kashmir National Conference at Srinagar. All this, and very much more, is happening in Kashmir today. It passes one’s comprehension how any Indian officials could behave in this barbarous and inhuman way to their fellow countrymen. = But humanity apart, surely there could be no more effective method to make the position of the ruler intolerable to his people. The military forces under their British officers may, for the moment, succeed in shooting and killing and overawing the people of Kashmir. How long will they do that and what will be the results? Are they going to make the people loyal to the Maharaja at the point of the bayonet? That is not the way human beings function and that certainly is not the way the Kashmiri is going to function. What part the Maharaja has in this sorry business, I do not know. But undoubtedly he will have to suffer for the policy of his administration. In any event, the Ministers of the Maharaja must shoulder this responsibility and they will have to answer for this before not only the people of Kashmir but public opinion in India. What again is the part of the Resident and the Political Department in this business? They too will have to make it clear where they stand in this matter. Whatever the rights and wrongs of any policy, there are certain limits beyond which no government dare go, except at its peril. The Kashmir Government has gone beyond these limits in its desire to crush a popular movement which is firmly established in the hearts of the Kashmiris. Everyone who knows Kashmir knows also the position of Sheikh Mohammad Abdullah there. Tic is the Sher-e-Kashmir beloved of the remotest valleys of Kashmir. Numerous legends and popular songs have grown around his personality. He has been, and is, one of my most valued colleagues in the States people’s movement, whose advice has been sought in all important matters. Does anybody think that we are going to desert him or his comrades in Kashmir because the Kashmir State authorities have got a few guns at their disposal? We shall stand by the people of Kashmir and their leaders in this heavy trial that they are going through. If they have erred in any matter, we shall tell them so frankly, but for the moment their blood is being shed in that lovely and fertile valley and all talk of legal niceties is quibbling. The fate of nations, when passions are aroused, is not decided by lawyers’ arguments. 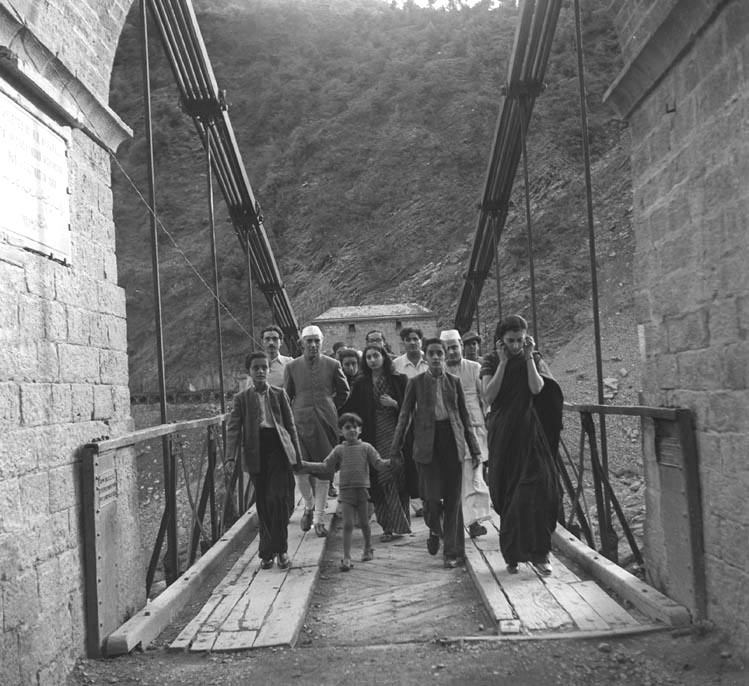 On way to Kashmir: This rare photograph shows Pandit Jawaharlal Nehru and Mrs Gandhi and her children crossing the Batote bridge in May 1948. Kashmir by itself is important, but this issue obviously affects all the States in India and it is for all of them to consider its significance, more specially at this time when we are supposed to be hammering out the future of India. It is a bad sign at this particular moment for the blood of a people to be shed and for State authorities to display their military might in repressing their own people. The talks that we are having about India’s future become pale and shadowy before this grim reality. Things have gone far in Kashmir, perhaps too far already. Yet they might grow worse. It is up to everyone concerned with Kashmir or with the States generally to try his utmost to cry halt to this. The Kashmir State authorities should also give thought to the inevitable consequences of their actions. I have postponed my visit to Kashmir for the present because I was not quite sure that I could render effective help at this stage. I want to help, as far as I can, in ending this terribly bitter conflict and the moment I feel that I can be of such help I shall go. Meanwhile, I would appeal to all concerned, specially the newspapers, to avoid giving a communal turn to what is happening in Kashmir. I have noticed with deep regret some highly intemperate articles in the Lahore press. It has been the policy of the State authorities to encourage communal troubles. We must not fall into this trap. To the State authorities, I would say that their actions are bringing grave discredit on their name and no government can live with that disgrace attached to it. The world still remembers Amritsar and Jallian Wala Bagh. Are we to have yet another gruesome memory to pursue us in the days to come? Let there be an end of all this and a calm consideration of the issues at stake. They will require all the wisdom and forbearance that we may possess.